There is one thing insurance companies and shippers both want to avoid, cargo insurance claims. For the insurance company’s part, the reason is obvious. They have to pay a claim. For the shipper, or insured, the reasons are even more compelling. 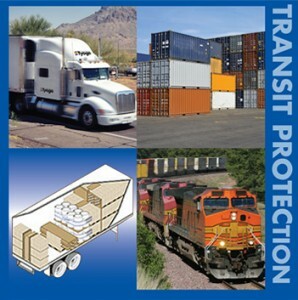 Why is Freight Protection Important? Even though a shipper can be made whole for a covered loss by a cargo insurance company, the shipper can’t ‘buy back’ the damage to their relationship with their customer due to a non-delivery. If chronic damaged freight deliveries keep showing up at your customer’s door, and they will no longer be your customer. Safety hazards created by freight with substandard packaging and securing are a considerable risk. Many of the trucks and trailers you see on the morning news flipped on their sides blocking traffic are due to shifting freight inside the trailer. This liability can easily work its way back to the shipper in the event of a tragedy. Leaning freight is dangerous. Ask anyone who ever opened a truck or shipping container door only to have the freight spill out. Every truck, rail trailer, and ocean container has a capacity based on weight and cubic meters of space. Are you maximizing this capacity? Many shippers don’t load their palletized shipments to the capability of the conveyance due to the fear of tipping. In short, they send out half empty trucks. In many cases proper freight securing dunnage applied properly will allow more freight, which translates to more profit, per shipment. Having the proper freight securing products is only half of the objective. The application of those products is paramount. Buying freight securing products is easy. If you have ever typed in “dunnage” into an Internet search engine, you know there are plenty of products. The task of application rests squarely on shoulders of the shipper to fend for on their own. For no more than the cost of normal dunnage supplier, you can buy from a manufacturer that knows the proper application and will show you the best techniques and usage. With our manufacturer of dunnage products we will study your freight, modes of transit, and load plans right down to the pallet patterns. After your shipments have been studied, you are supplied a plan of what securing products are needed and exactly how they should be applied to allow you to maximize the capacity of each shipment while reducing the risk of cargo damage. The manufacturer will then supply your entire product needs to allow you to secure your freight is the best possible manner to maximize your profit and reduce your risk. How much does the consulting cost? Nothing. How much more does our manufacturer’s products cost than an everyday ‘buy of the rack’ supplier? Not a dime more. We know if the products are doing the job as engineered, your results in reduced cargo damage and maximized capacity will keep you our customer for years to come. Let us look at your freight. Simply contact us to see how you can reduce risk and maximize profit. Better yet, send us a plan of what you are doing now and any problems you are experiencing with damaged or shifting freight. The call you make to us will be a fraction of the cost of the call you don’t make to us.